Neil Sterritt has made major contributions to British Columbia and to First Nations over many years, working tirelessly and selflessly both to strengthen his people’s proven ability to embrace opportunities while holding onto traditional values. He has brought all British Columbians together on the common ground of hope and possibility. Born in Gitxsan territory, Mr. Sterritt left the northwest as a young man to study and work in the minerals exploration industry throughout Canada, overseas and in the USA. He returned in the early 1970s as manager of the ‘Ksan Historic Village and Museum, and served as president of the Gitxsan-Wet’suwet’en Tribal Council. While president, he was involved on behalf of his people in the National Aboriginal Constitutional Conferences during the 1980s and the Charlottetown Constitutional Conference in the early 1990s. 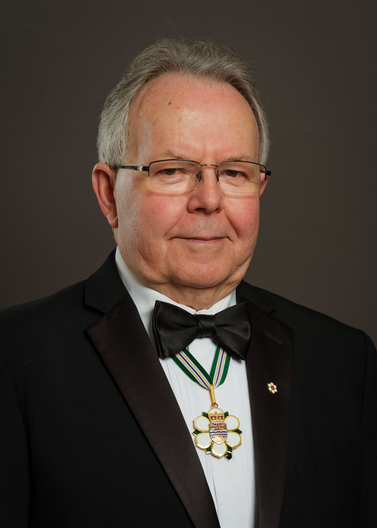 Mr. Sterritt served as Director of Land Claims and Self-government with the Assembly of First Nations in Ottawa. He worked with more than 100 elders in identifying and mapping the traditional Gitxsan territories, an effort that was the basis of the court action that became known as the Delgamuukw case. For many years, Mr. Sterritt led governance workshops aimed at assisting Aboriginal communities make the difficult transition from paternalism to self-reliance. In this work with most of the B.C. and Yukon First Nations, he has explained legal and fiduciary responsibilities in the context of First Nations’ culture and traditions. A leader in land claims and other First Nations issues over many years, Mr. Sterritt is well known outside of Canada, having been invited to lecture, advise and tour aboriginal communities in Australia, East Malaysia, New Zealand, Norway, Thailand and the United States. This year, Mr. Sterritt was awarded the BC Book Prizes Roderick Haig-Brown Award for his book Mapping My Way Home: A Gitxsan History and an honorary doctorate of laws from the University of Victoria.